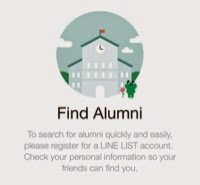 Line - the free messaging, voice and video call platform from Korea, just launched "Find Alumni" feature at its application. It is said that the feature can turn the reunion from traditional way to digital way. I have that Line app in my iPhone. So let me try to use this feature. From my Line app, I just click the "more" button and click "Find Alumni". In the feature, I need to choose Primary School, Middle School, High School or University. So I click University. After finding the name of my university and adding the year of my study, I just click "Add My School". Okay, I hope the number will be increased soon. Line has listed all the schools and universities registered at the Department of Education and Culture. The app also opens the chance for people to add their school if they are not listed yet. I am just wondering why there is no specific category by year and faculty at the university field. This could be a good homework for Line. And I am also wondering how Line can position itself face to face with Facebook that never say it is a reunion app, but it reunites people in reality from the bigger classification, not just school, but also family, business, and many more. Overall, the Find Alumni feature is quite easy for the users. The schools and universities can find it very useful for their database. Instead of making a new column for alumni at their website, they can just link the feature at their website. Simple, easy, fun and free. I also like pick, the app from Naver Corporation - a part of the companies that create Line, for sharing fun pictures. Anyway, enjoy your digital reunion!